1. Preheat the grill to high. Whisk together the oil, honey, harissa and 1 tbsp vinegar to make a marinade, then season. Toss the aubergine and onion with 2 tbsp of marinade on a baking tray, then spread out. Grill for 15-20 minutes, turning once, until the aubergine is tender and starting to char. 2. While you wait, put the couscous and dried fruit into a large bowl, season, then stir in 200ml just-boiled water. Cover and leave for 10 minutes. Add 1 tsp vinegar to the remaining marinade to make a dressing. 3. 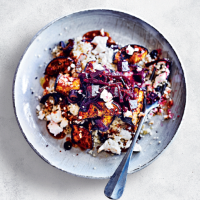 Fluff up the couscous, then toss with 2 tbsp dressing, the beetroot salad, aubergine, onion and most of the cheese. Drizzle with the rest of the dressing and top with the remaining cheese to serve. Cook’s tip Fancy something different? This salad is also delicious with figs in place of the aubergine and dried fruit. Or add some cooked chicken or lamb for a meaty version.